This is a post from SPS partner Saleswarp, based in the USA. We’re bringing this blog to Australia as we know a number of clients are talking about this subject right now. Just-In-Time (JIT) inventory refers to an inventory management method whereby the goal is to have inventory readily available to meet demand, without having any excess quantities on hand. With this approach, merchants can hold minimal stock supplies while ensuring stock-outs don’t happen during peak selling periods. Balancing the goals of avoiding stock-outs while minimising inventory costs is at the heart of JIT. Today, retailers are selling on multiple channels and also fulfilling goods to customers by a variety of methods (buy online pickup in store, shipped direct to consumer, fulfilled by Amazon, etc.). This further complicates inventory information and visibility. A lack of inventory visibility can impact retailers, suppliers, and consumers alike. JIT programs highlight the importance of having the right inventory management system in place to ensure real-time stock visibility, helping you make better business decisions. Companies that experience growth, but don’t have sufficient inventory management processes in place often suffer from inefficient operations, low customer satisfaction, and stock issues. Inventory management requires time and money. To improve business operations, a retailer may consider implementing a JIT program as a time-saving, profit-boosting measure. However, like other inventory management methods, a retailer needs to thoughtfully consider both the advantages and disadvantages of JIT programs. Decreased Inventory Costs – Reducing inventory on hand results in decreased labour and storage expenses that were once required to store and manage inventory. This extra space can be used for other business operations such as an in-store pickup counter to improve the customer experience. Reduced Markdowns – Often, excess stock forces retailers to quickly offload unsold products with markdown prices. By carrying minimal inventory, retailers can lessen the amount of old stock that needs to be marked down. These resources can be re-allocated to pursuing growth-oriented opportunities, for example, expanding to an additional online marketplace. Fewer Production Errors – Smaller, more frequent inventory orders allow for product defects to be spotted more easily. A decrease in product defects means fewer returns to process and refunds to manage. High-quality products also reflect positively on your brand, likely resulting in repeat customers. Inaccurate Forecasting – JIT inventory requires accurate forecasting. Because market demand can be volatile, it’s hard to predict. Not only do retailers need to calculate expected customer demand, but they also need to be prepared for the consequences that may occur when these calculations are wrong. Some outcomes are more severe than others. In the case of a stock-out, retailers could risk losing 10% of sales. Late Deliveries – For the JIT method to work, the deliveries themselves need to arrive ‘just in time.’ Late or incomplete shipments result in stock-outs and delayed customer deliveries, hurting brand reputation and bottom line. Suppliers, drop shippers, and manufacturers need to closely collaborate with the retailer to supply products and materials — often with little notice. This level of synchronisation and communication requires tightly integrated systems and active partner management. Is market demand relatively stable? As mentioned above, JIT methods require accurate forecasting. If it’s difficult for a retailer to predict future inventory levels, a JIT program would be challenging to implement successfully without significant concessions or contingencies. What do supplier relationships look like? Again, as previously stated, successful JIT methods depend on reliable and responsive suppliers. Integrations need to in place to facilitate effective communication and coordination. What’s the size of the business? Typically, JIT inventory models don’t work for small retailers. Low inventory volume results in a higher cost per unit, making this model unaffordable for smaller retailers. Although it may seem daunting, it’s not impossible to adopt a JIT system for your company. Achieving and maintaining inventory optimisation is possible and profitable, with the right type of help. 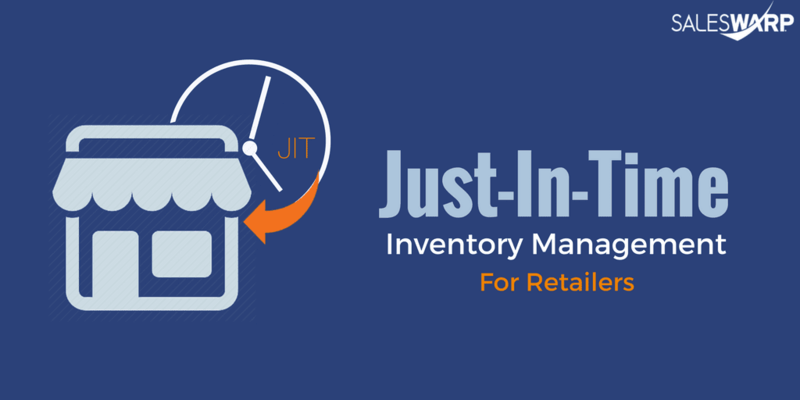 Retailers who are thinking about adopting a JIT program should consult with a retail management expert and if needed, consider the purchase of an inventory management system. The right inventory management system can equip retailers with real-time inventory data to quickly respond to changing market conditions – critical to a business’ cash flow and profitability, and ultimately, customer happiness. SALESWARP is a distributed order management solution designed for retailers at every stage of growth. As the premier engine for omnichannel selling and fulfilment, with built-in business logic, SalesWarp helps retailers manage operations and data more efficiently across their entire organisation. Unmatched in scalability and performance, SalesWarp’s cloud-based software gives retailers the ability to meet both current and future customer demand, while optimising operations to drive business growth and profitability. To get more relevant updates like this, follow SPS Commerce on Facebook, LinkedIn and Twitter. You can also get retail and supply chain news, resources, expert tips and other valuable updates delivered directly to your inbox weekly for free by subscribing to the SPS Commerce blog. Want to learn what your peers are doing? Almost 500 Australian retailers, suppliers, and distributors shared their winning strategies in our annual benchmark survey. Learn why some companies are pulling ahead while others are falling behind with our 2018 retail report. What is ‘distributed order management’ and how does it fit with modern retail? Data cleaning – should this be done before or after a system migration? Retail Insight snippets: retail’s accelerating tech budgets?